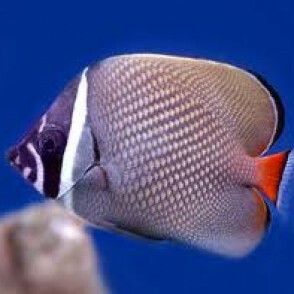 The Pakistan Butterflyfish, also known as Red-tailed Butterflyfish, Collare Butterflyfish, or Redtail Butterflyfish, has a rich brown to black color with light spotted scales throughout. 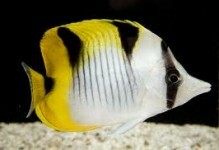 Its mask-like head includes two white bands with a black band through the eyes. 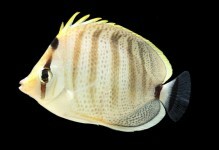 The tail is most distinct with its wide red band followed by black and white bands. 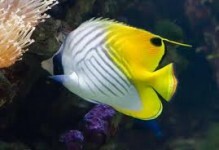 The Pakistan Butterflyfish eats stony corals in the wild and care should be taken when housing it in a reef aquarium as it will nip at many sessile invertebrates that grow on live rock. A 125 gallon or larger aquarium is suitable for a pair introduced to the tank together, otherwise, is best kept singly with plenty of swimming room. 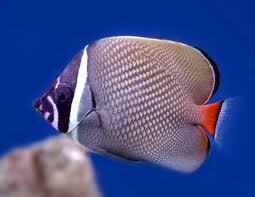 The Pakistan Butterflyfish requires a varied diet including marine fish, crustacean flesh, brine shrimp, and frozen meaty preparations. 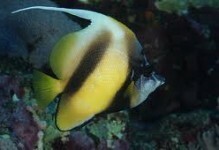 Once acclimated to the aquarium, it requires feedings several times daily.